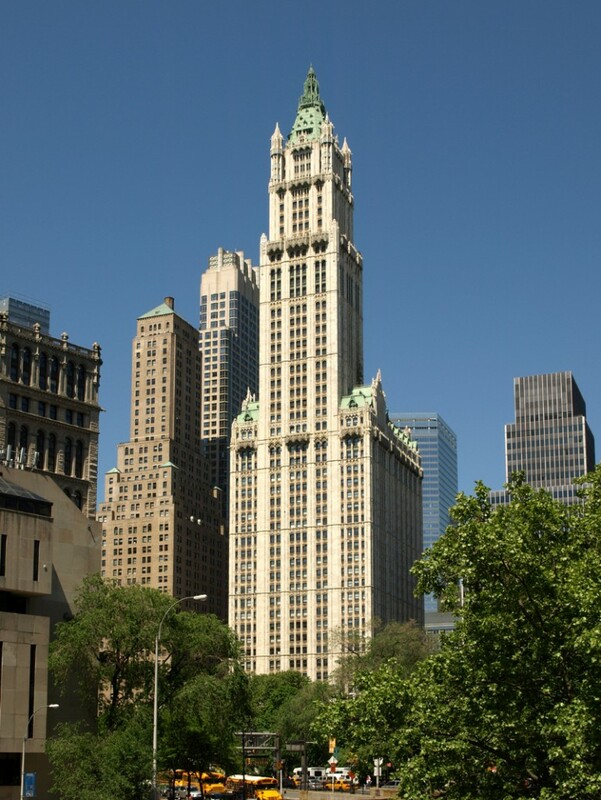 When it was completed in 1913, the Woolworth Building was the tallest building in the world at a height of 241 meters (792 feet). It lost this prestigious title in 1930 when the Bank of Manhattan Building (now The Trump Building) completed a few blocks south. 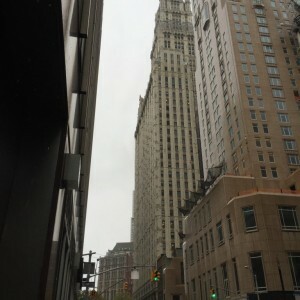 However, the building has remained a landmark for the city, notable for its Neo-Gothic style, intricate ornamentation, and detailing on its façades. 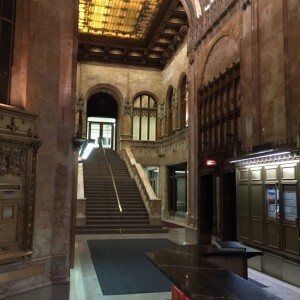 The building was financed in cash by Frank W. Woolworth and completed as an all-office building. Currently, the upper tower from the 29th floor to the pinnacle at floor 58 is being converted into residential units. 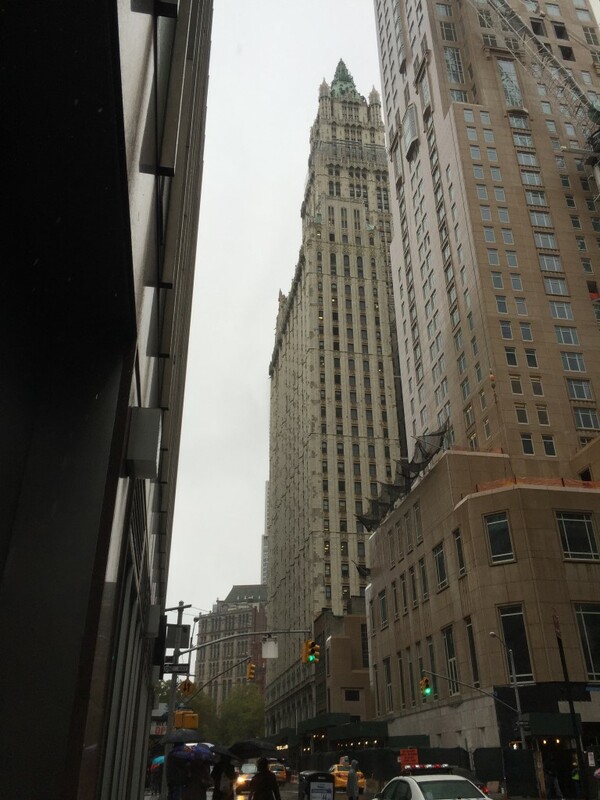 This conversion/restoration was the focus of the CTBUH Tour. 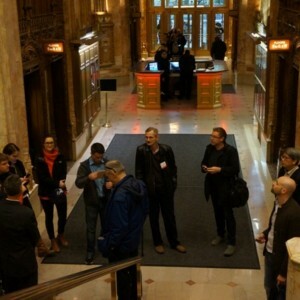 Attendees gathered in the lobby where they met Alex Saltzman of Alchemy Properties, the building’s current owners, who kindly hosted the tour. 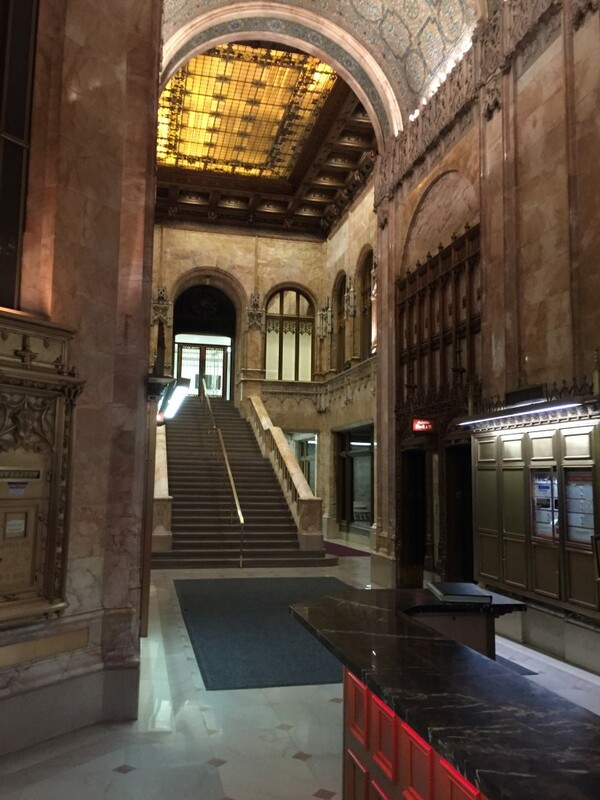 Not open to the public, attendees were treated to a tour of the historic lobby, which has been maintained in its original form with the exception of the lighting systems and the front desk – though the original desk still resides in the building’s basement storage facilities. The lighting has been updated to LEDs and utilizes gel covers to recreate the warm tones that the original lighting provided. 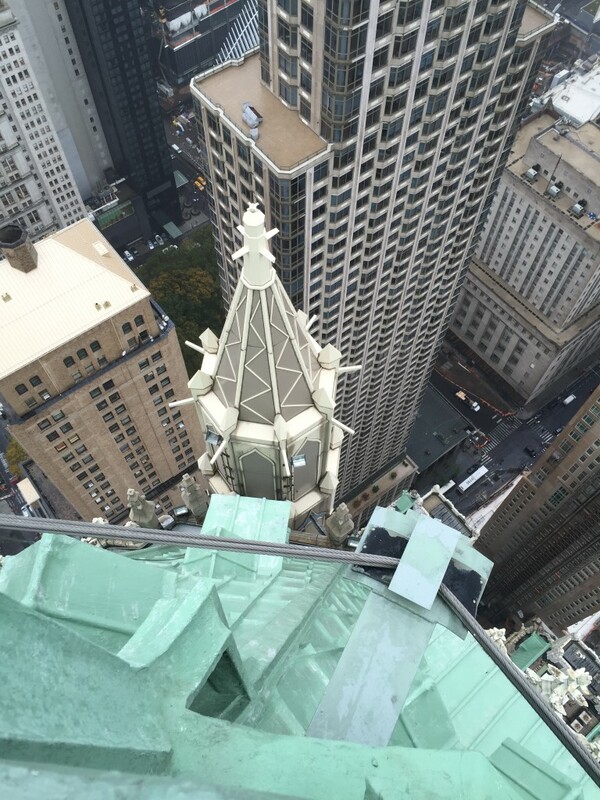 This has been done to prevent the harsh white LED light from changing the original character of the historic lobby. A separate lobby space is being created for the new residential component, achieved by converting a former store front and reversing the opening direction of one of the elevator shafts, which will now serve the upper residential floors. 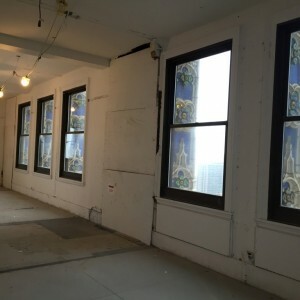 Once completed, the new lobby space will be adorned with tiles that were salvaged and restored from Mr. Woolworth’s original office space on the building’s 40th floor. Currently, the elevator shaft houses a construction elevator, which attendees rode to the top of the tower. The ride to the top was quite loud and the challenges of an active construction site on top of an operational office building were discussed. A further construction challenge is that there can be no crane operation on the building, so all material transfers for the entire conversion must go through the single construction lift. 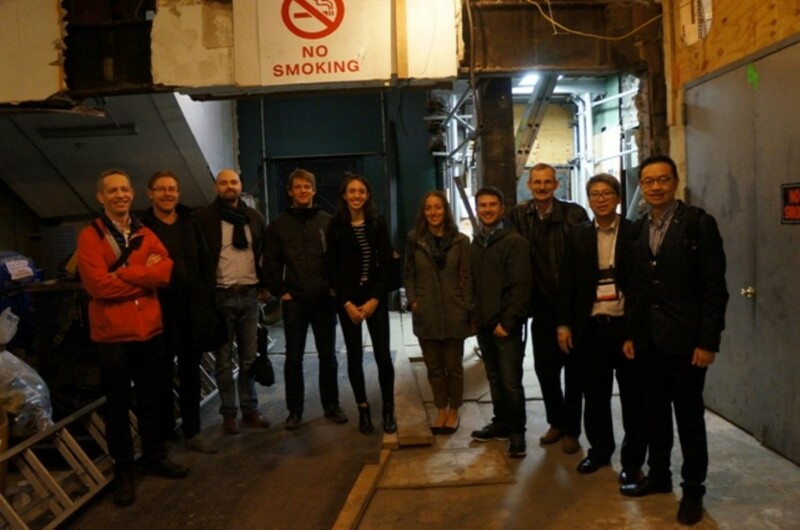 Upon arriving on the 50th floor (about 210 meters above ground) attendees learned that this was the first floor of the eight story penthouse unit. 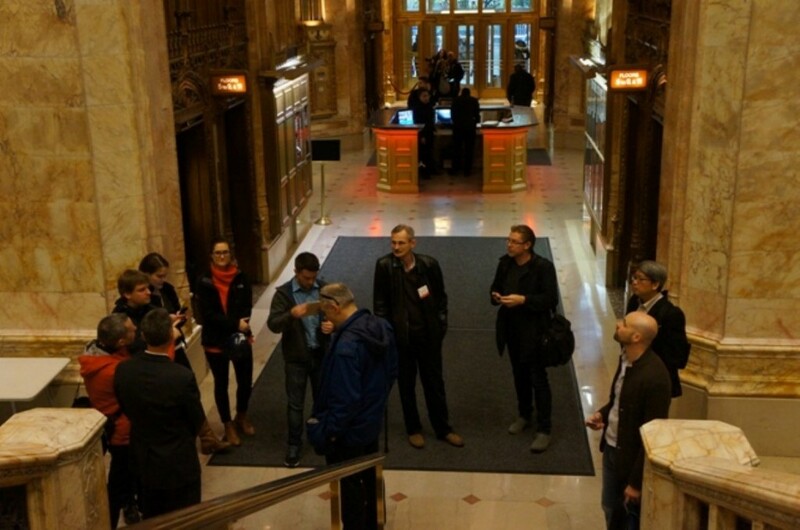 Though it was only gutted at the time, attendees walked up through the various floors and were shown large print outs of the plans and renderings that made it easy to image the grandeur of the space upon its completion – aptly coined by some as a “castle in the sky”. 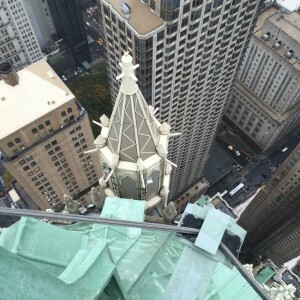 Despite the rainy weather, at the very top of the tower delegates were able to climb a spiral staircase that lead out to an outdoor crown’s nest at the building’s pinnacle, where they caught sweeping views of the New York skyline. At one time, this was part of a public observatory that is believed to have had 400,000 visitors annually at its peak. Now it will serve as one very wealthy New Yorker’s private balcony. After descending the penthouse levels back to the elevator, attendees stopped at a more typical residential floor conversion. The floor was completely open, with paint outlining the unit plans so potential buyers could walk the spaces. It was at this level that the incredible detail on the buildings façade was most striking. 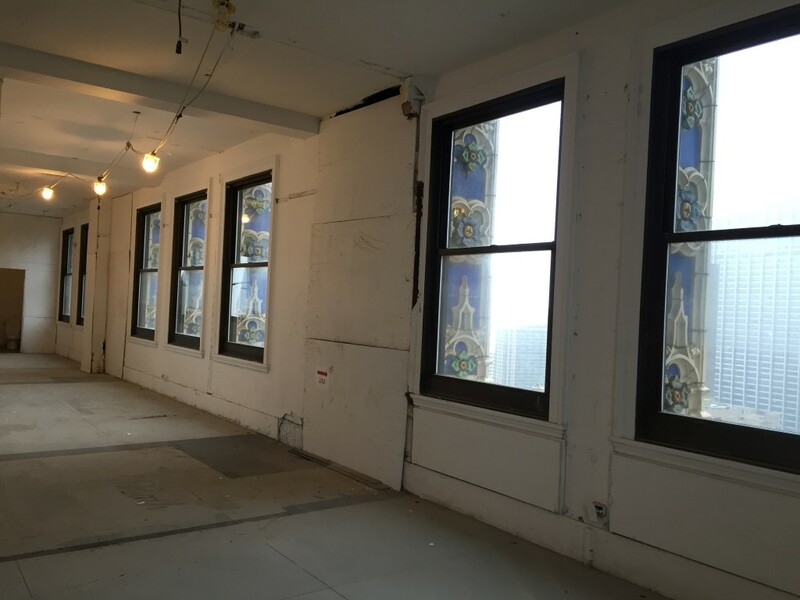 Not as noticeable looking at the building from ground-level, the windows are framed in colorful terra cotta work that is carefully being restored as part of the conversion.